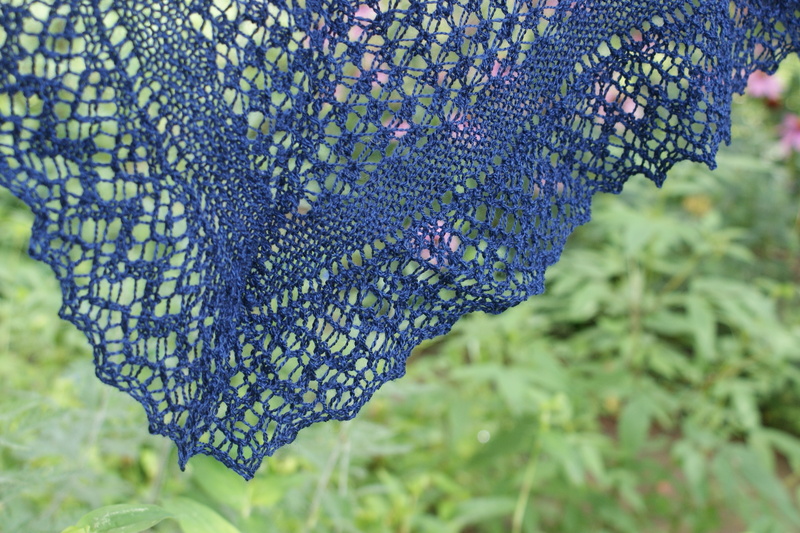 So I set out to try PFHR as a way to talk about something other than stuff I knit. 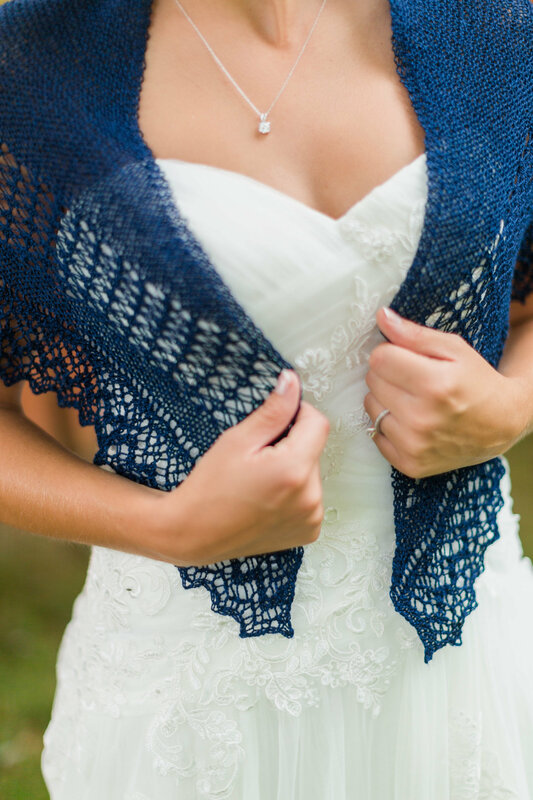 But this week I couldn’t help but remember that I still haven’t shown you Carina’s wedding shawl. 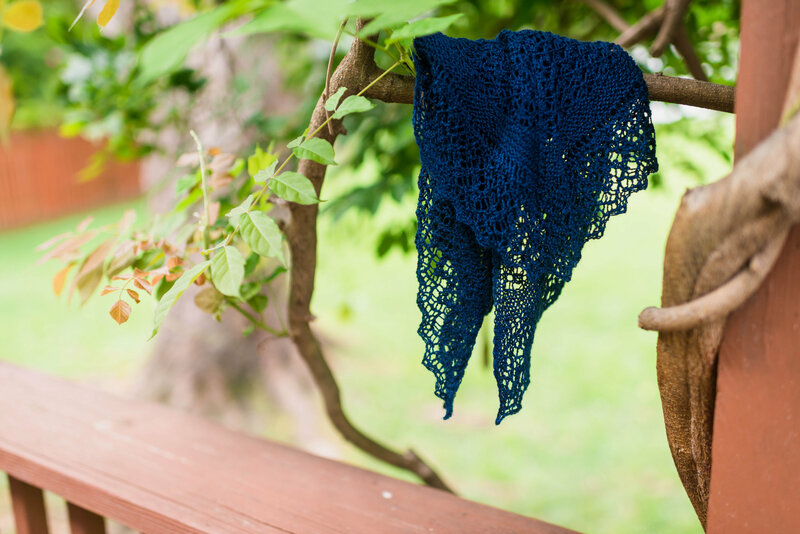 And there’s so much to this story of pretty than just what I knit. And if you stick it out to the end, this post somehow evolves into a tiny essay on pastoral theology. Carina is my sister-in-law, my husband’s youngest sister, and the whole family was pleased as punch (if entirely unsurprised) to learn last winter of her engagement to her now-husband. 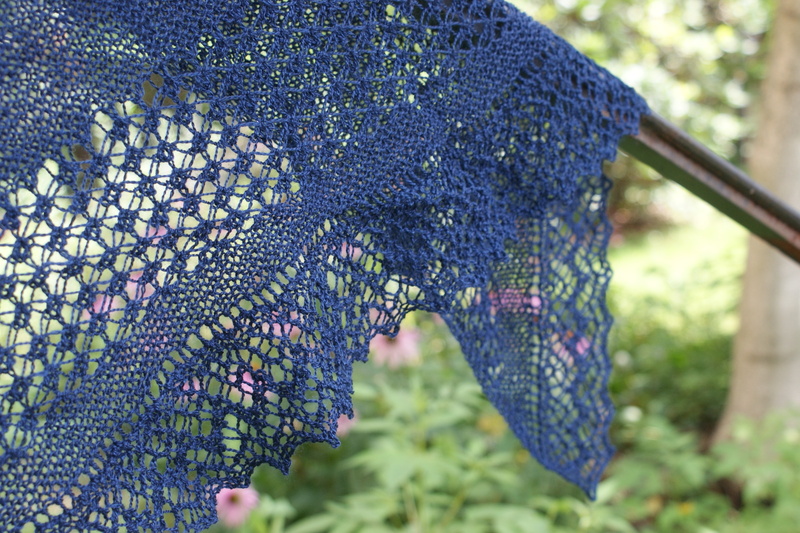 Sometimes – when I am not limited by circumstance – I like to offer to knit a shawl for a friend about to get hitched. I never mind if the bride says no, or says yes but not for use on the Big Day. It’s just an excuse to make something beautiful for a beautiful and beloved person to remember their big day. I had a lot of fun (and a lot of help) planning my wedding, but so many of the physical artifacts from the day itself were just pointless to retain. Things have to be useful to keep a place in my small home. We still have my bouquet and Jared’s boutonniere (our flowers were silk), and the unreasonable number of port glasses that were part of our centerpieces (we unearth them for the annual round of homemade egg nog). A shawl, in my imagination, is a little more durable. Doesn’t take up much space, is eminently useful (counter-intuitively, the holes in lace make it very warm, as it traps air), and is beautiful. I don’t know if my sporty sister-in-law is quite as pragmatically-minded as I am about such things. But she is herself a craftsperson, so I was delighted when she not only said yes, but selected the pattern herself through a series of email communications (and many Ravelry links). The pattern we landed on was Rock Island (by Jared Flood). I knit it pretty much exactly to directions; I even swatched (and washed and blocked said swatch! You can tell I was serious) hoping to reach specified dimensions. My one itsy bitsy regret is that it ended up quite a bit smaller than I’d hoped. 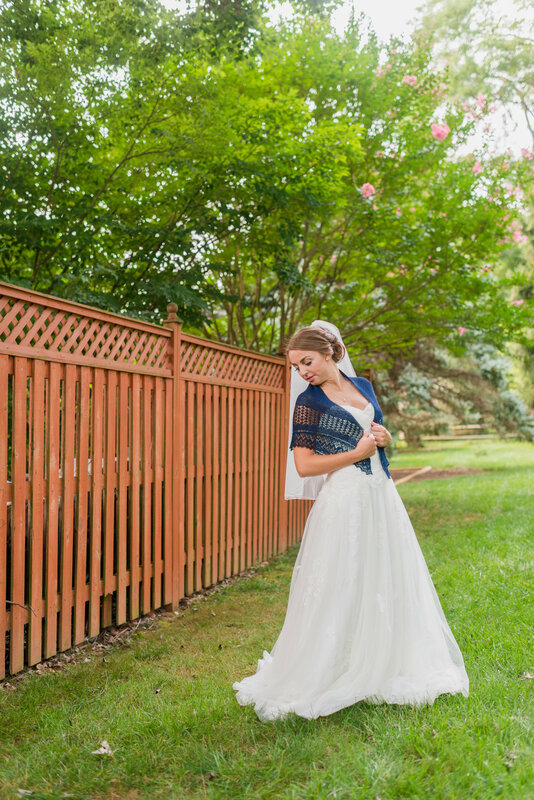 In my opinion an heirloom shawl for a special event should be… a little more ample. And, knit from the bottom up, there was no adjusting the size without ripping the whole thing out. My consolation is that it will be more practical this way. There are really no words. I keep trying but it keeps not working. 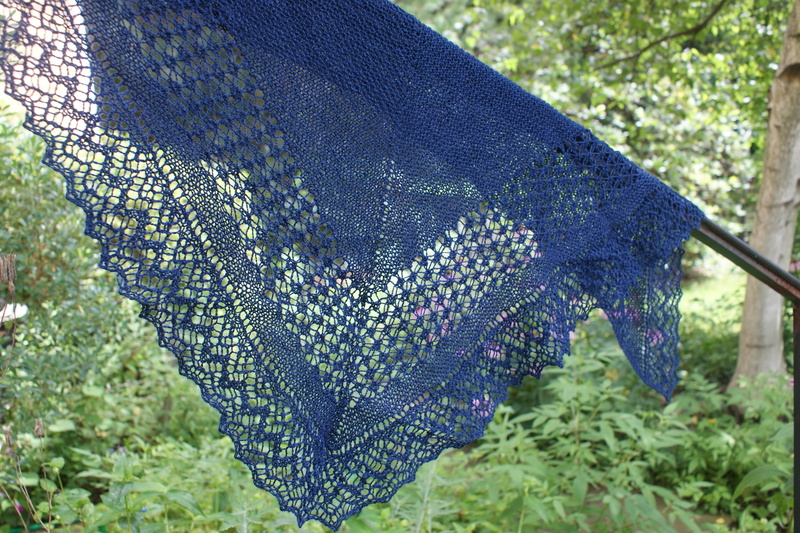 Oh and the shawl is nice too. 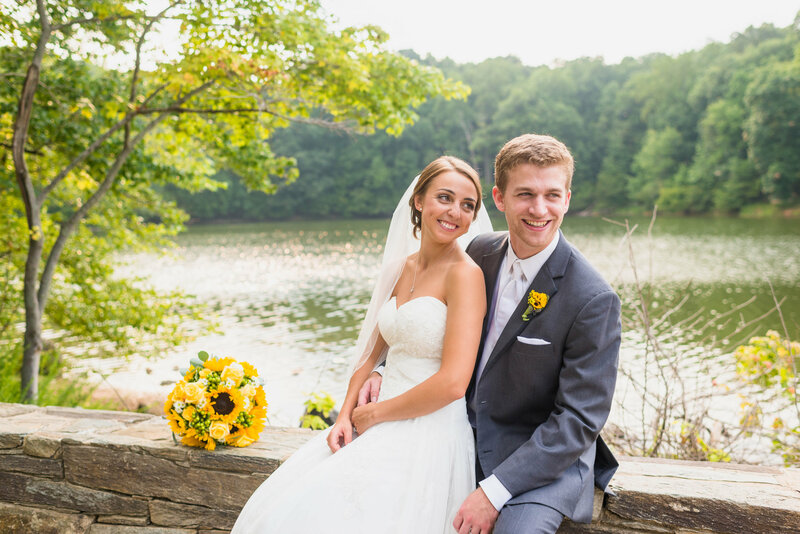 Did I mention how excited we were to see these two get hitched? Of course, our involvement in the day went beyond accessories. It was with about three parts glee and one part trepidation that we accepted Carina’s invitation for our little N to be her flower girl. 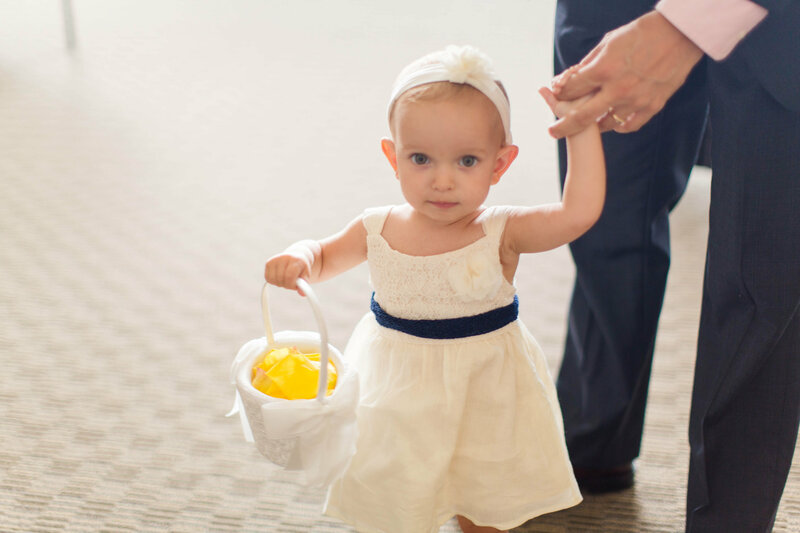 Mind you, when the invitation was made, said flower girl wasn’t actually walking yet. 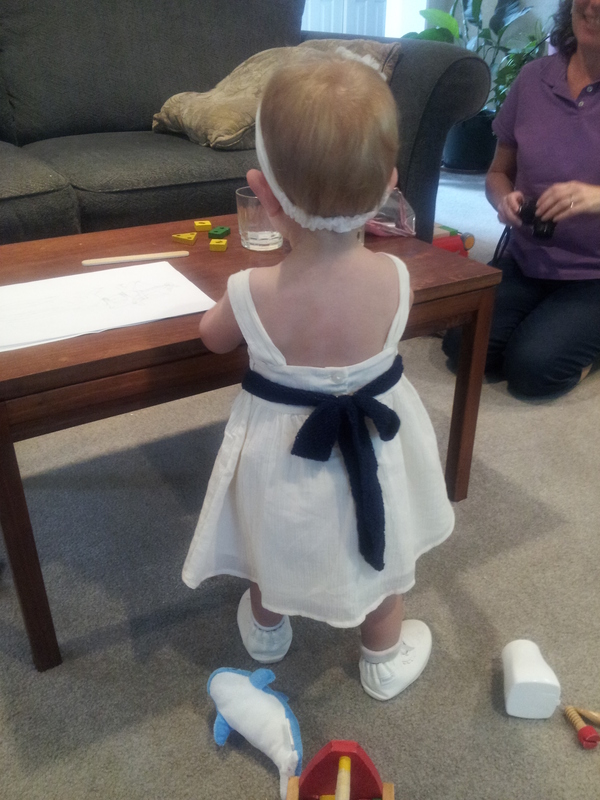 The dress and headband are from Children’s Place, the shoes are from Robeez, and the sash is some garter stitch made with some lace leftovers from Carina’s shawl. A back view from one of the few moments I could keep the bow straight. N had been walking for only a month or so before the wedding, so we fretted and fussed greatly over her Big Moment. (As if anyone would care about her performance beyond her being cute.) 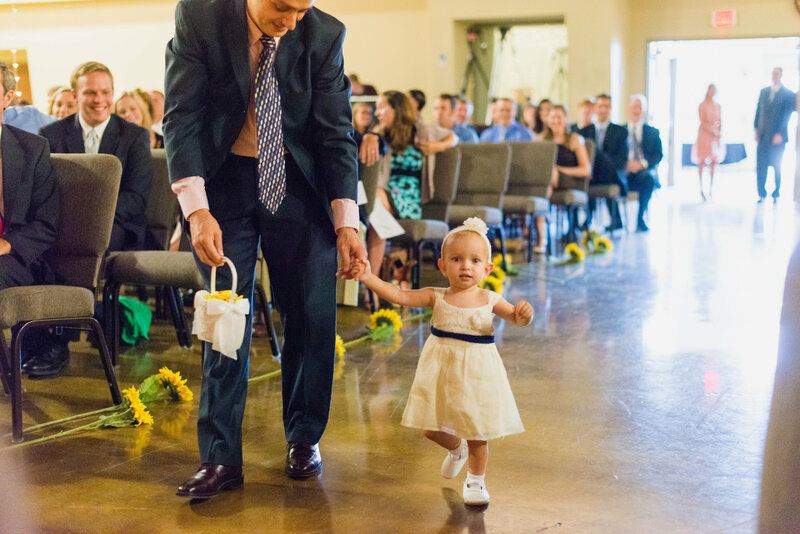 We practiced her walking up the aisle about a million times before hand, deciding I would beckon her from up front while Daddy accompanied her as backup. We strategized the exact moment to put on her headband so as to reduce the chances of her pulling it off. In the end, she waddled up most carefully, eyes all wonderment at this strange scene, needing Daddy’s hand the whole way. She then proceeded to much on nuts through the whole ceremony. 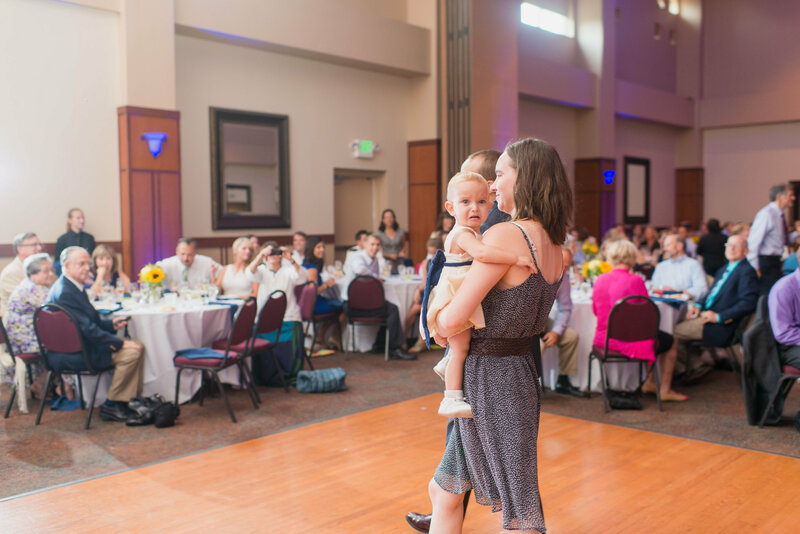 She was less impassible at her introduction at the reception. Of course, we all know marriage is not all dresses and parties and softly glowing photos. I daresay this couple knows that, and their ceremony made that quite evident. Marriage, and parenting, and most things involving love of any sort, and most other things worth doing, are hard. Harder, it turns out, than I think. I am discovering that I am woefully new at the process of learning by experience. Not, like, just living life – I have done a bit of that, for a 28-year-old – but the putting-yourself-out-there, nobody-holding-your-hand, failing-fifteen-thousand-times, really-don’t-know-what-you’re-doing-but-there’s-no-other-way-to-figure-it-out type experience. Trial and error. Emphasis on the error. Learning how to learn that way, taking risks, trying new things, and picking myself back up again when it goes wrong, and persisting when it takes forever to see results: this is the sort of experience I think I lack the most. Call it the Curse of the Fairly Bright: when most basic things come quickly to a sharp brain, the ability to learn things the hard way never develops. It is also the sort of experience I want the most. Why? Because relationships require that exact sort of work. And I am becoming increasingly convicted that pursuing relationships is at the dead center of a calling to be a pastor. It’s at the center of that calling because it’s the material out of which the Kingdom of God is built, the main work of godly marriage and parenting, the avenue for the priesthood of all believers to embody Jesus’ love in the world. It’s a hard thing to realize that perhaps the keystone skill in the life’s work God is calling you to is somewhere near the bottom of your list of natural talents. It’s not something I studied. It’s not something I could learn from books. It’s not something my culture or personal history equipped me well for. It’s not something my past worldly success will help me with. It’s just what I have to do. Dear heavens, if that isn’t real, I don’t know what is. Done and Done and Eek! Thanks for the posting the pictures, Rebecca. I’ve been wondering how it turned out ever since you mentioned that you were making one. Absolutely beautiful! 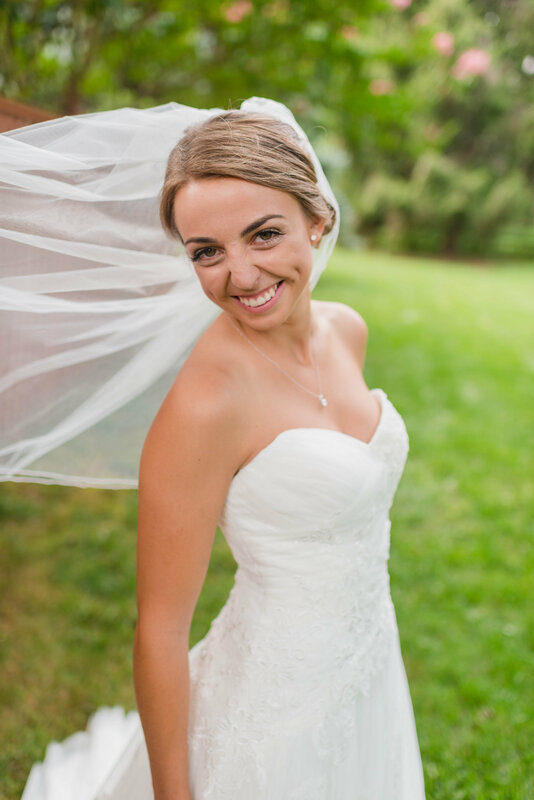 And the bride too!